I am really looking forward to your challenges. I figure if you guys can post your baddies as well as the goodies, I guess I can too :) I’ll see you on the other side! The Dynamic Duo! I love this idea, Nat! You and Julie are so inspiring and full of heart, each in your own right–it is amazing what comes from the two of you together!! 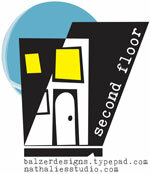 Can’t wait to see what the launch of Second Floor looks like tomorrow! Like a kid at Christmas–I feel like going to bed right now so the morning will come faster! Lol! Hugs! Looks like it will be FUN — can’t wait to see what you’ve got up your sleeve! I’m going to hike to the second floor! So ready for the trip! Thanks for leading this project, Nat and Julie! I’ll be back tomorrow ;-). Nat this is a FANTASTIC idea! I’ve been in a creative rut lately, and this will help me greatly! I’m in!!! You and Julie ROCK!!! I am in!….I just have to figure out ( or rather get my wonderful brainy loverly daughter) how to add the blinky-do to my blog!….I am a failure with techno stuff……I am ready for this “journey”…you and Julie both are such wonderful inspirations! You two are so wonderful together and I look forward to the Second Floor challenges.